Earlier this year I read and loved Jeffrey Eugenides' most recent novel, The Marriage Plot. Off the back of that success, I decided to also read The Virgin Suicides, which I had seen Sanne review on Youtube. 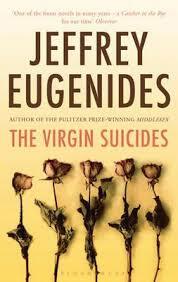 I think the mark of a really great contemporary writer is the ability to write books which are totally different in format and plot, but united by a strong writing style, and Eugenides certainly has that. His style is preppy in an American East Coast way, while at the same time concisely making astute and truthful comments on modern American life. And he doesn't even need to be talking about modern America! In 1974, the five engimatic Lisbon sisters one by one commit suicide as the neighbourhood boys watch on, captivated by these women who seem so central to their lives and yet so isolated from it. (It wasn't until I watched the film (Sofia Coppola's directorial debut in 1999) that I could pinpoint the year in which the book was set, but it was 1974. In hindsight, this does seem obvious. Not being American myself, however, some of the sign posts may have gone over my head a little, haha.) First to go is Cecilia, an inwardly focussed and slightly morbid loner. The family goes into mourning and the town seems to wrap them all in bubble wrap, becoming at once fascinated with coming up with why and determined to avoid them in case tragedy is contagious. In the midst of this comes Trip Fontaine, the school heart throb, and his ingenious plan to take Lux Lisbon and her sisters on the only date of their lives. But even this cannot stop the literal decay in the Lisbon girls' lives. I think what really kept me turning the pages of this relatively short book was the strength of it's characterisation. Told in an almost documentary style, where the neighbourhood boys appear to be compiling eyewitness testimonies, we get to know many of the characters after the fact, such as the monolithic figure of Mrs Lisbon whom they encounter in a bus station nearly ten years later simply because it's possible to get coffee there. Where characters in this format have the potential to become romanticised (Lux, the dreamy, misunderstood princess or Trip the school heart throb), we are instead shown the best concrete specific details to build real people out of the recollections. For example, the mystery of Trip's "coolness" is explained by a story of his being deflowered in Acapulco by a blackjack dealer who teaches him the ways of women, and he is shown to be getting advice throughout his pursuit of Lux from his father and his father's lover. Lux is first described as being all eyes and nostrils, and she wears a sack-like dress (as do her sisters) to homecoming. A strange novel, described on its cover as a Catcher in the Rye for our time, I would classify The Virgin Suicides as being a deeply introspective book, a puzzle with no key, a frustrating but fascinating account of a family's downward spiral. My favourite line in the whole book is when the Doctor says to Cecilia, "what are you doing here? You have no idea how bad the world is yet" and Cecilia says "Obviously you've never been a 13 year old girl."